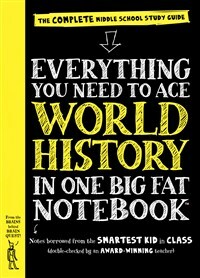 It’s the revolutionary world history study guide just for middle school students from the brains behind Brain Quest. The BIG FAT NOTEBOOK™ series is built on a simple and irresistible conceit—borrowing the notes from the smartest kid in class. There are five books in all, and each is the only one book you need for each main subject taught in middle school: Math, Science, American History, English, and World History. Inside the reader will find every subject’s key concepts, easily digested and summarized: Critical ideas highlighted in marker colors. Definitions explained. Doodles that illuminate tricky concepts. Mnemonics for a memorable shortcut. And quizzes to recap it all. The artwork is by the same artists who generated art for the workbooks: most notable among them is Kimble Mead, whose distinct look has been a trademark of Brain Quest products for over fifteen years.